Well, it’s not my dog actually, it’s one of the dogs in my book. But he’s mine, in a sense, and I’m taking his death hard. So hard, in fact, that I can’t bring myself to write the death scene. I’ve written around it, the before and after. But the real-can’t-be-ignored scene? No thank you, just can’t do it. Or at least not tonight, when my partner is off on a hiking trip and I have the house to myself and my own dog is past 13 and has hurt her leg and my cat is sick and my other cat is 17, and when I look around the living room I think: I’m going to lose them all, probably within the next year. And I don’t know if I can bear it. Please, Beebs, live forever, okay? So instead of writing poor Willie’s death (lucky dog: He gets to live a few more days. What will he do with this extra time? Shuffle around the yard? Sleep in a patch of sun? Pee on the hallway rug?) I took my own limpy dog for a walk and then went swimming. After I came home I still couldn’t write the death scene. So I made chives bread. I craved something spicy yet dense, something that would appeal to my tongue while filling my belly. who dreams silently, his legs pumping. you are the door he’s passing through. And maybe it was my mood but the bread refused to rise, and while good and warm and grainy, with a nice bite from the chives, it was also heavy, as if mirroring my mood. Bread, I think, can do that, mimic your emotions, force you to see what you’re trying to ignore. 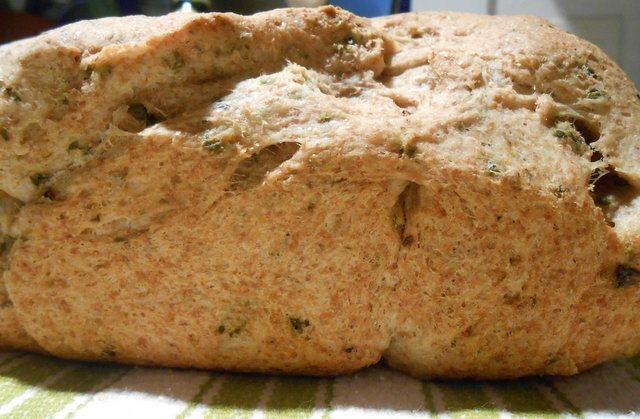 Dear Chives Bread: Why, oh why, didn’t you rise? I’ll post the recipe later, if I ever get the tweaks out. Bread is very temperamental, which is why I love it so. If anyone has a favorite bread recipe or poem, please feel free to share. Cinthia ~ Your blog posts seem to always touch my soul & heart in such specific ways. This one an example of which I speak. Your beloved Beebs ~ Your words are powerful ~ thank you. Thanks so much, my dear. One of these days, when I finally, finally hand in my novel and my life settles down, we must get together. Until then, enjoy the autumn. The cooler nights make for such cozy writing, no? Take care. Thank you for your vulnerability and heart, Cinthia. What moves me most is what you share about yourself as a writer – how very real and beloved your characters are to you, two- and four-legged alike. I’m already a fan, but this affirms that you’re a writer/human I’m glad to know. One of my writing partners recently finished a memoir about her dog. (http://karineumeyer.com/bark-and-lunge-the-isis-story/) I’ll be sharing this one with her. Thanks again. Thanks for the shout out, Tele! I’m poetry challenged, but the tongue part rings so painfully true. Cinthia, I certainly relate to the struggles of losing dogs fictional and true. I’m glad Tele connected us and look forward to reading your work. Hi, Kari! Thanks for stopping by. I am totally loving your blog. I swear, I’d love to fill my house with dogs and cats and just live in messy splendor. Until then, I am down to just one of each, sigh, sigh. Cheers and keep in touch. Thanks, Tele! I’ve discovered Kari, and I love her blog (someone who loves dogs and loves to write–yes, please). I’ve also been enjoying your writing on your blog. Very powerful and lyrical. I can smell salt water as I read. You are working on a book, right? Take care, and happy writing.